Summary: Poor Noah Grimes! His father disappeared years ago, his mother’s Beyonce tribute act is an unacceptable embarrassment, and his beloved gran is no longer herself. He only has one friend, Harry, and school is… Well, it’s pure hell. Why can’t Noah be normal, like everyone else at school? Maybe if he struck up a romantic relationship with someone – maybe Sophie, who is perfect and lovely – he’d be seen in a different light? But Noah’s plans are derailed when Harry kisses him at a party. That’s when things go from bad to utter chaos. I’d heard about Noah Can’t Even before it’s release and it somewhat slipped under my radar a little. What kept me wanting to read this book was the slight niggling feeling i had that Simon was going to be announced as a YALC author this year. Low and behold he was, so i added it to my YALC TBR list immediately. First of all, i think this novel is one of the most tragically hilarious novels i’ve had the pleasure of reading. I was aware that it was supposed to be amusing, but any books that ‘sell’ themselves as funny, i never usually find funny and most of all, cringy. I didn’t have that with this story. It was full of wit from Noah’s character (…and what a character he is) that did actually have me laughing out loud at so many parts. He’s such a tragic character that you cannot help but laugh a little at his misfortune and little quips. One thing that did make me cringe a little, and this was purely on a personal note, that Noah reminded me A LOT of one of my ex-boyfriends. That made it really difficult to seperate the two later on in the book and i could only imagine these things happening to him. Now THAT was tragic! For Simon’s first book i found that the story and the characters were done extremely well. The writing included. I find often with first novels that it’s very much a ‘this happened then this happened’ situation, that gets quite boring. As much as this novel is very much event after event, it’s written well and doesn’t seem too overpowering for a reader. In fact i really liked the idea that these awful things were happening to Noah one after the other. There were some themes in Noah Can’t Even that i wasn’t expecting so much of. Such as the LGBTQ+ aspect. 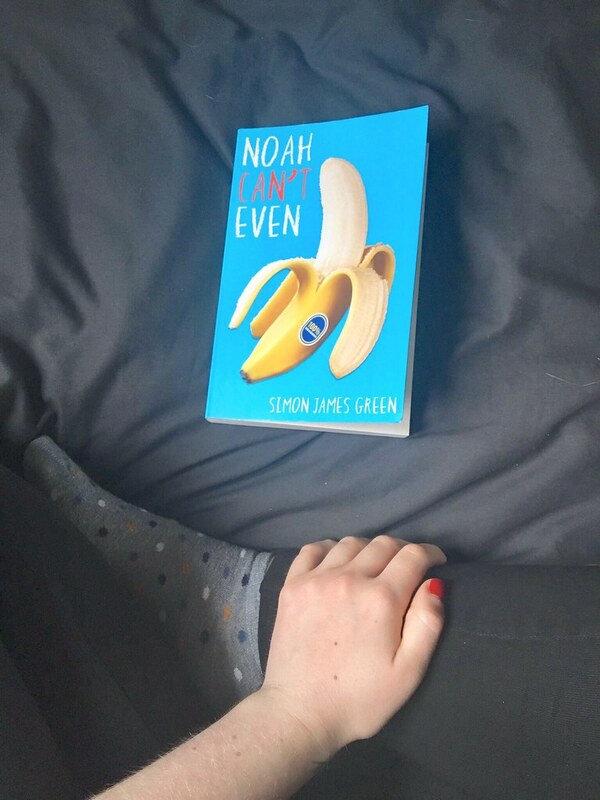 I was aware from the beginning that Noah’s best friend Harry was gay, and i quickly became aware that Noah would question his sexuality throughout this novel, but i appreciated the amount it was brought up without being directly addressed. It was refreshing to watch a character figure out his sexuality themselves. The one thing i was a little fathomed by was the fact that Noah seemed a little older than fifteen to me. I would have placed him at seventeen maybe to really pack the punch about him being a virgin and slowly discovering his sexuality. I spent most of the novel pretending it was set in college instead of high school. I really did enjoy this story, there was no part i didn’t enjoy or lost my interest in. I found it extremely funny with loads of little remarks that were incredibly British. I cannot wait to see what Simon has to say at YALC about his novel and read more of his future work. You can get a copy of Noah Can’t Even on Amazon* or check it out on Goodreads.